The last three weeks I’ve been working on various projects in the house. The first one I finished off has been on-going since Christmas last year. We bought material and the mechanisms to put up Roman blinds in the lounge. I made the first blind at Easter. Later in the summer I made two more. 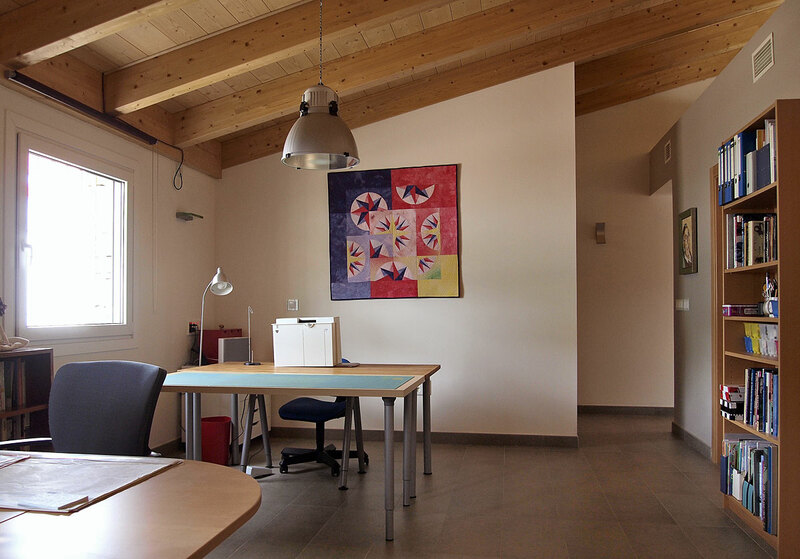 We have 3 windows and wide patio doors in the lounge so there are a lot of blinds and I don’t have much time for sewing when I am here in Spain. So the two large blinds for the patio doors had to wait until now. It felt good to finally tick off that project from the To do list. 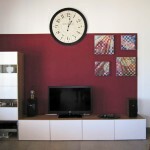 Next on the list was painting the wall behind the TV and media furniture. We agreed on the colour for the wall last time I was here at the end of August. So that we only had to buy the paint and get started. It took the two of us to put up the painter’s tape to create the outline, as we didn’t plan on painting the entire wall. But once that was up I was left to my own devices with the paint. It took 3 layers of paint and some final touching up to get a good finish. But the final results have received much praise. 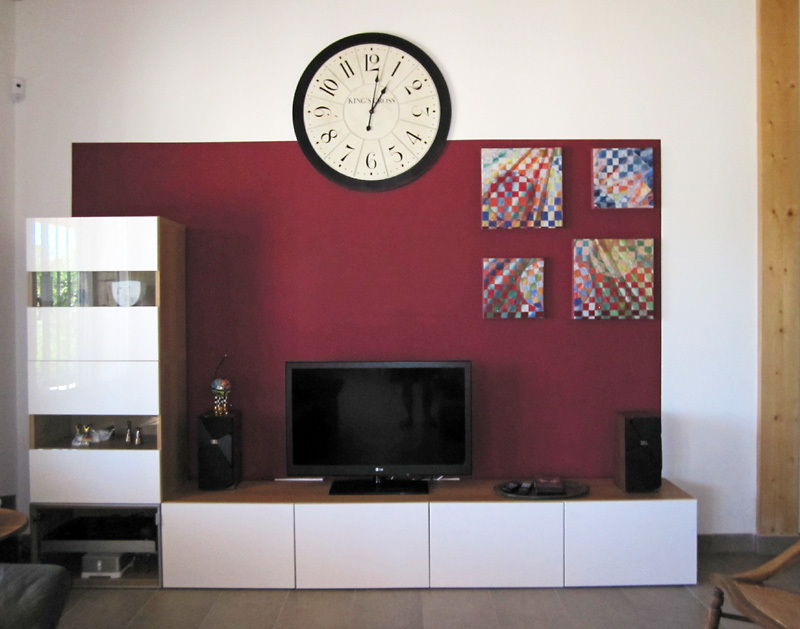 The original plan was to mount a couple of shelves with invisible mounting on the wall to balance the cupboards on the left hand side. We even bought the shelves and made two holes in the wall trying to get them mounted, but it soon became clear that it was not going to be a success. All the interior walls in the house are stud work and plasterboard. It’s the one thing we regret. It is a real pain trying to fix anything to them. The studs are metal and they seem to be everywhere. So after filling the holes and repainting the wall, enter Plan B. 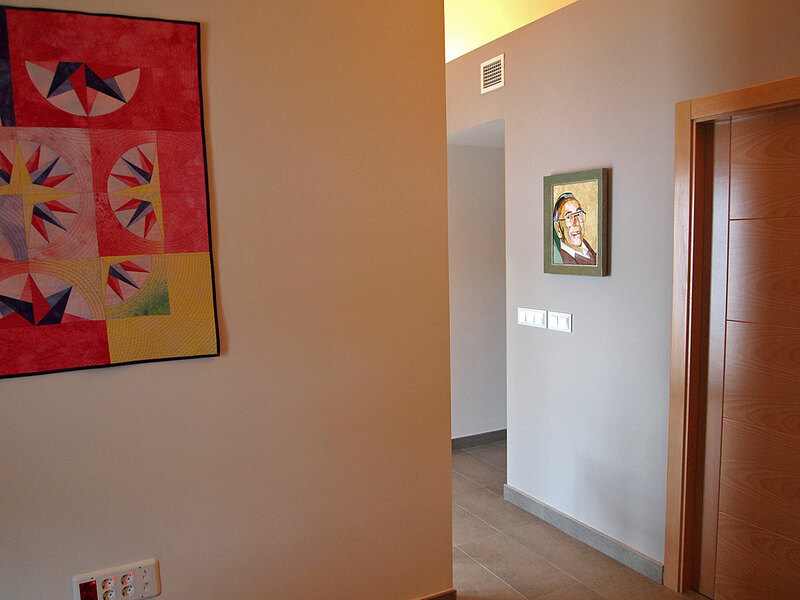 We decided to hang some art work instead. 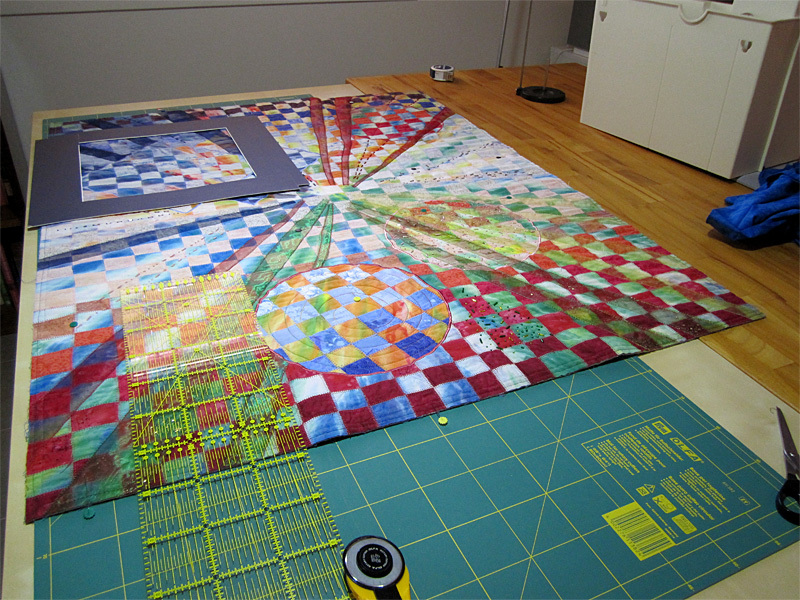 After pulling out various smaller quilts and not finding anything that really fit the bill I had the idea of slicing up Farbenfroh to make 4 smaller pieces. Despite having 2 attempts to get the whole quilt to hang well (I took off the first binding, retrimmed the edges and bound it a second time) it never did. 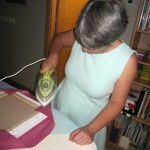 So although Sqeze was quite shocked that I was prepared to wield the rotary cutter, I had no qualms. 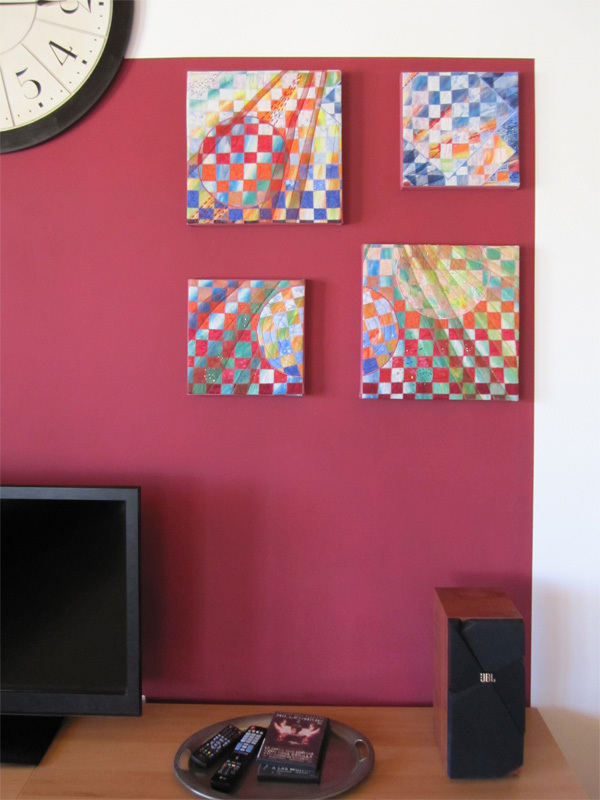 We bought 4 stretched artist canvases here in Xàtiva. 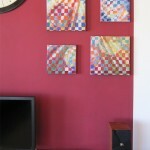 I dyed some material to cover the stretched canvases and attach the mini-quilts to. This was the fist time that I had done any dyeing here in Spain. Although I followed a recipe I had used before the finished fabric was quite a bit paler than expected. I don’t know if it’s the different water here, whether the dye powder is getting too old or whether it was because I didn’t wash the fabric before dyeing. Although it is unbleached cotton I suspect the latter may be the cause, but I’ve not done any more dyeing yet to find out. It was time for the cut! 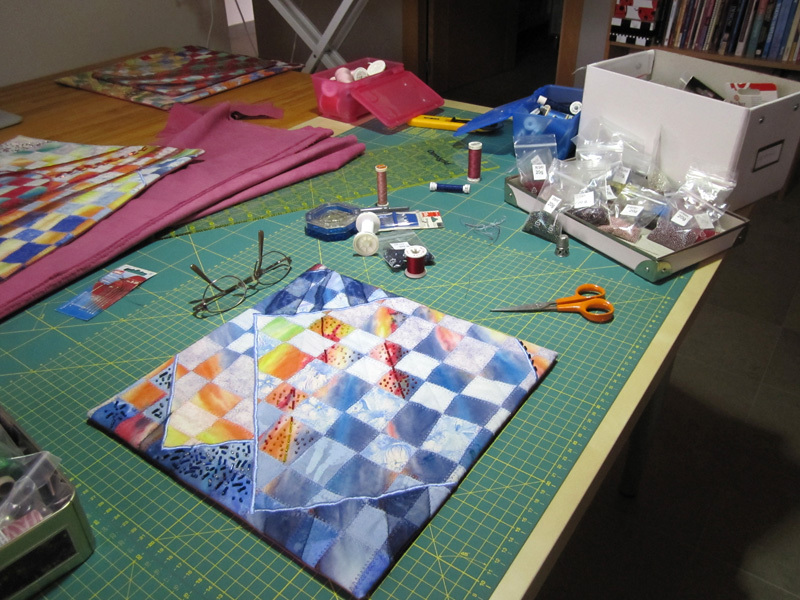 Using my two L-shaped frames cut from a large picture mount I first auditioned the areas that I wanted to use for the 4 smaller quilts. 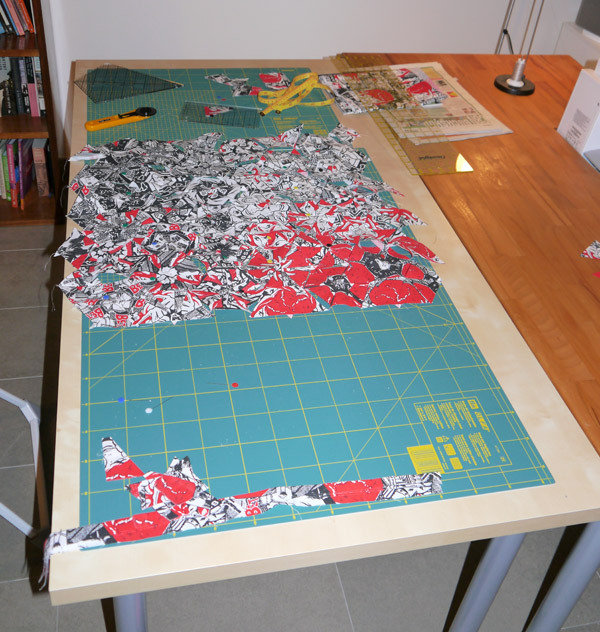 I pinned the areas as I went along to be sure that I didn’t overlap anywhere. After cutting them out, I faced the quilts using the fabric that I had just dyed using the method described by Kathleen Loomis in her tutorial here. Once faced I then took a critical look at each piece. One piece I left alone. On the other three I added some more beading. And on one piece I removed a piece of the sheer fabric that I had sewn to the surface of the original Farbenfroh quilt. 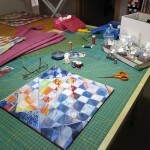 I did a small amount of hand quilting on that mini quilt too. 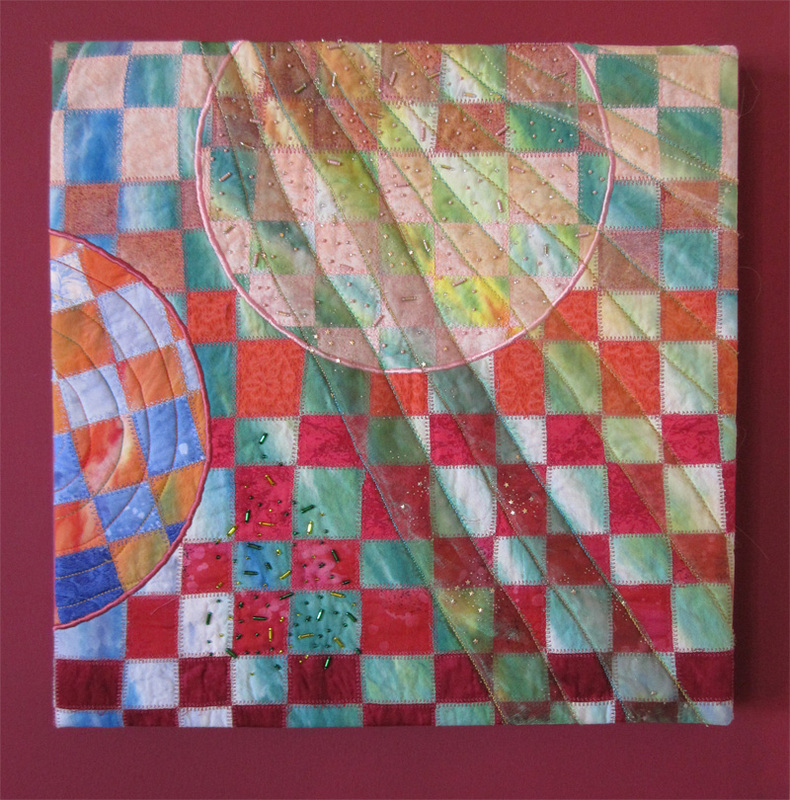 Once I was happy with the four quilts I cut four pieces of fabric large enough to cover the stretched canvases and wrap around the sides and onto the back. 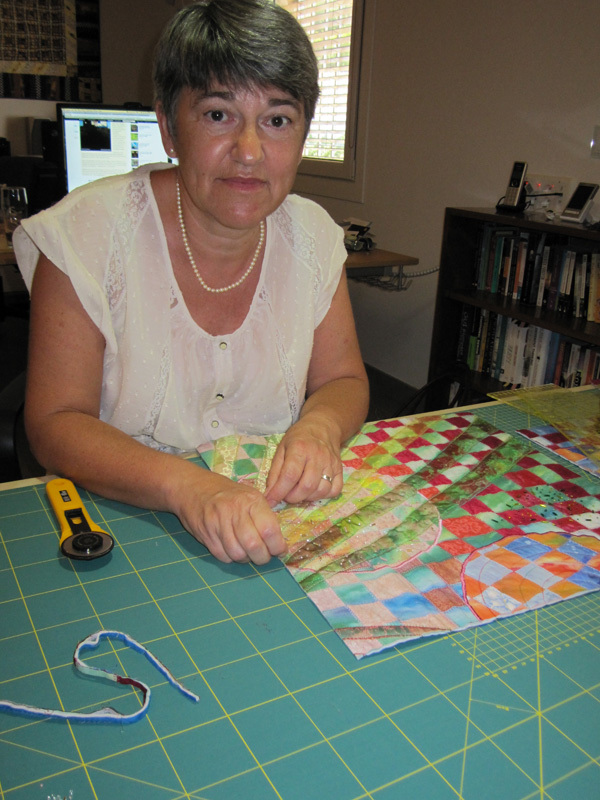 I sewed the quilts by hand to each piece of fabric using a backstitch. This was based on information I found here on Leslie Tucker Jenison’s blog. 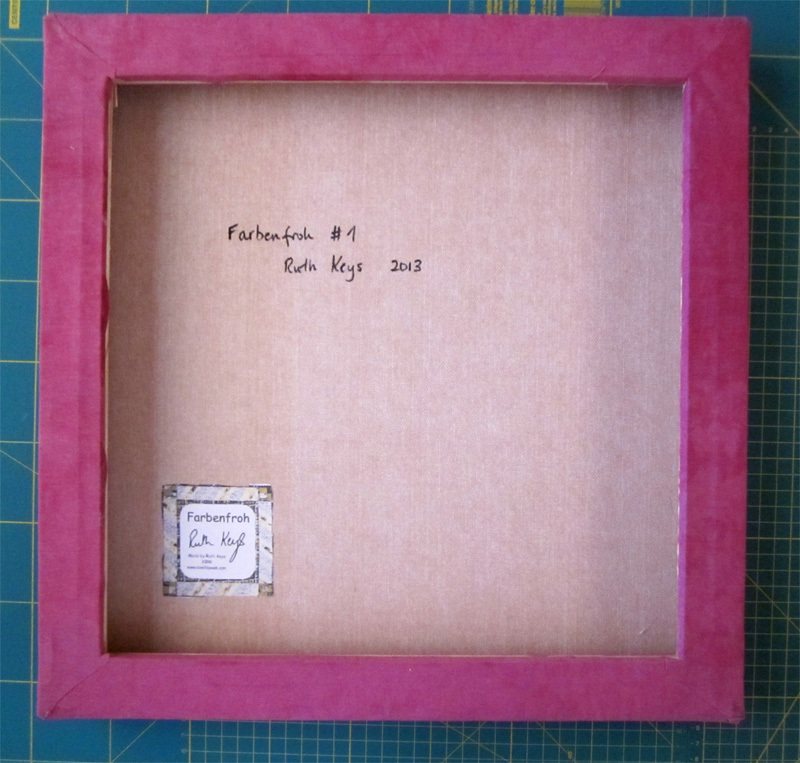 I used backstitch rather than running stitch because I felt the quilt would be less prone to sagging away from the canvas under its own weight. It might be overkill, but I remember learning at school that if you sewed seams by hand to use backstitch and not running stitch for a more secure seam that also looked better. 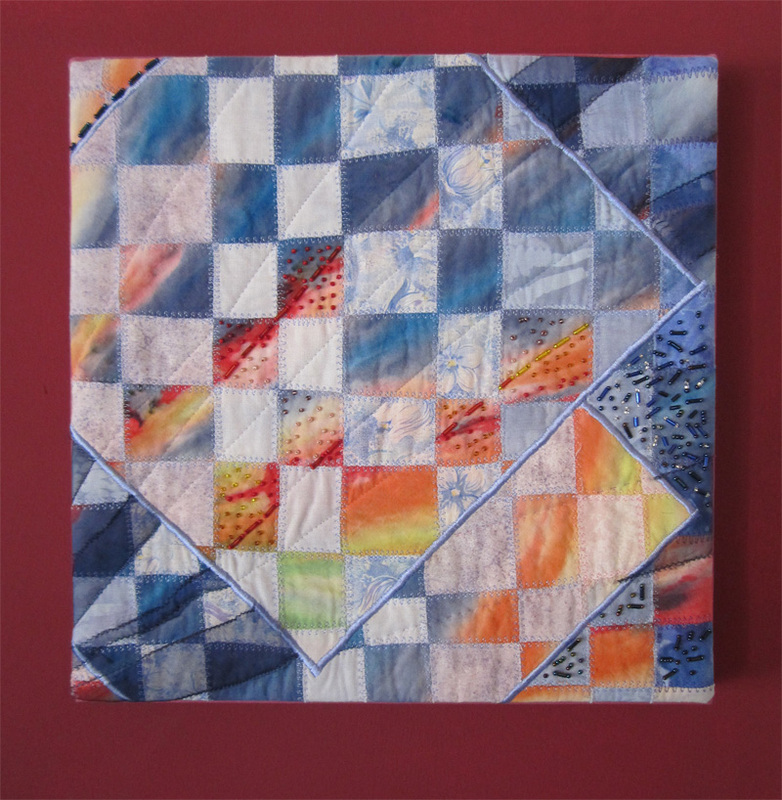 Finally I mounted the fabric and quilt to the stretched canvas using the method described by Lyric Kinard in her tutorial. 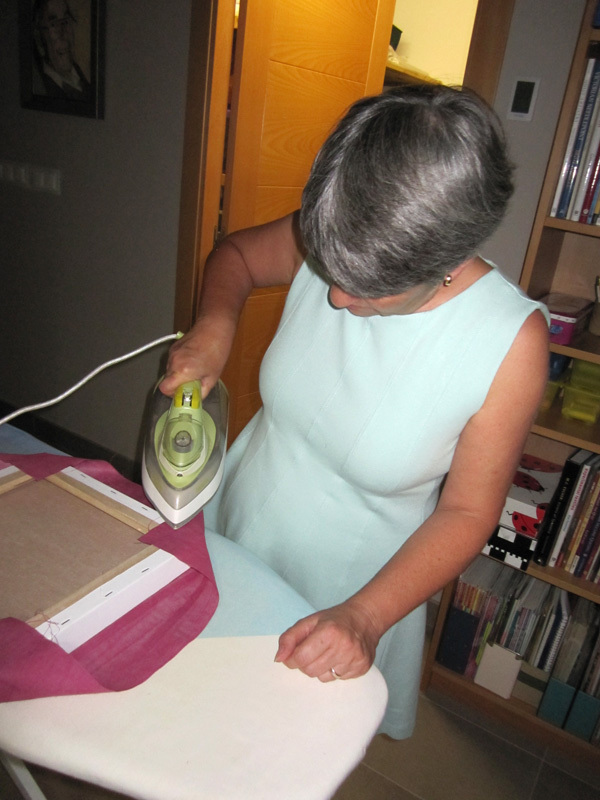 I was pleased to have found this tutorial, because I have not had good results in the past with stapling fabric to stretcher bars, even though we do have an electric staple gun. Lyric’s method gives a very neat finish and avoids staples. I wasn’t able to find the really strong fusible web here in Xàtiva (although I didn’t try all the quilt shops). The lighter web did not fuse as well to the wood of the frame as to the canvas, so I helped it along with some textile glue. 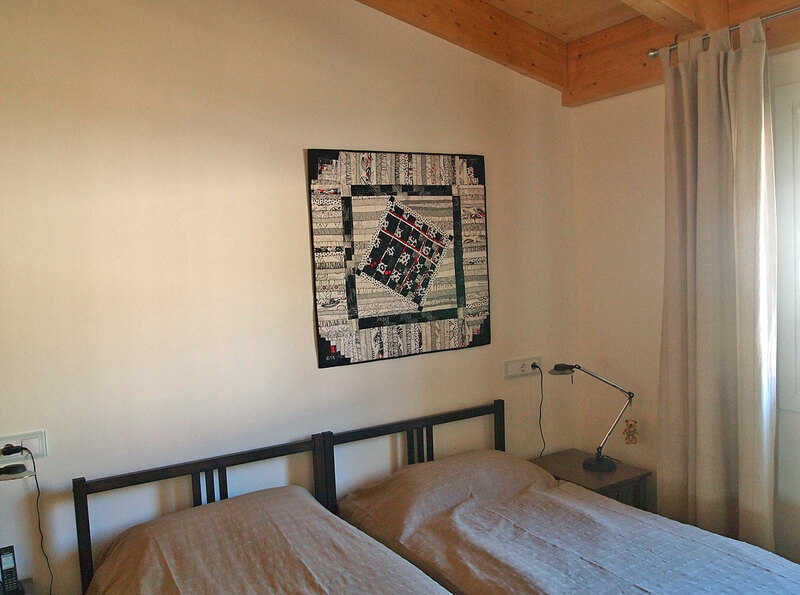 The only thing left to do was to mount the four quilts on the wall. 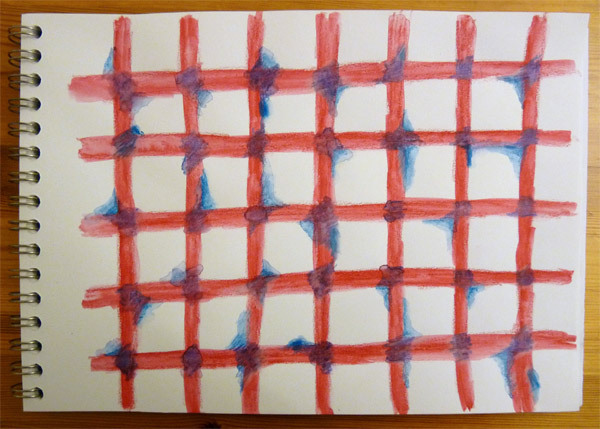 That was another joint effort involving much measuring and arithmetic to get them all lined up nicely in a square. We are very pleased with the final result. And I have no regrets about cutting up one of my quilts. How about you? 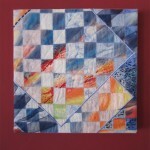 Do you recycle quilts? I’d love to hear from you if you’ve done something similar. Please let me know in the comments! The quilt actually got hung twice. First of all I made the sleeve and sewed it to the back and the same evening DH&CP cut a baton to size and banged some nails in the wall. That was Wednesday evening. On Thursday I realised that I hadn’t made a label for the back. So Thursday evening I made a label and attached it to the back. This is always a rather fraught operation, because I print the details onto PFD cotton ironed onto freezer paper and then feed into my Epson Stylus printer. If I am lucky it will print first time. Thursday was not my lucky day and the printer chewed up the first piece I tried to print on. Unfortunately the printer is not the most user friendly device when it comes to clearing paper jams. The second attempt on a new piece of freezer paper was a success, but as I was pressing under the seam allowances I realised that I had put the date as 2012. DH&CP had made an obtuse remark about 2012, which did not register with me when I was still at the printing on paper stage. 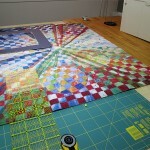 At this point I decided that the starting date for the quilt was good enough and not the completion date. I wasn’t about to go through the whole edit and pdf and fight the printer process again. 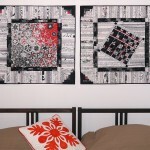 Here are a couple of photos of both black and white quilts hung together over the guest beds. I live in Leeds in Yorkshire, not too far from the beautiful Yorkshire Dales. I actually have no formal training in anything to do with sewing or my textile based work. I’ve learnt everything myself. I’ve tried many areas creatively over the years and now I find myself sewing which I adore. You can see more on his blog and on flickr. If that has whetted your appetite he has an etsy shop too. And he has cats, which makes him even more agreeable in my eyes. 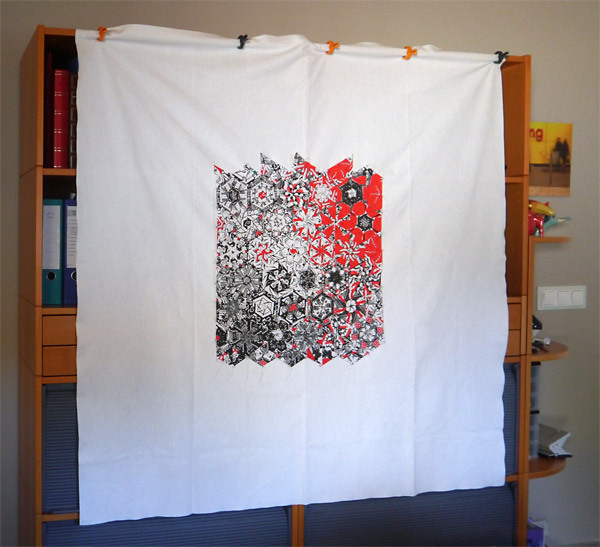 I did manage to almost finish the quilt I was working on – the sister quilt to “Black and White and Red all over”. I finished all the quilting and attached the binding. It was too late and I didn’t have the energy to make and attach a hanging sleeve. I left DH with instructions to take some photos to put up on my blog. The new design wall was pressed into service. 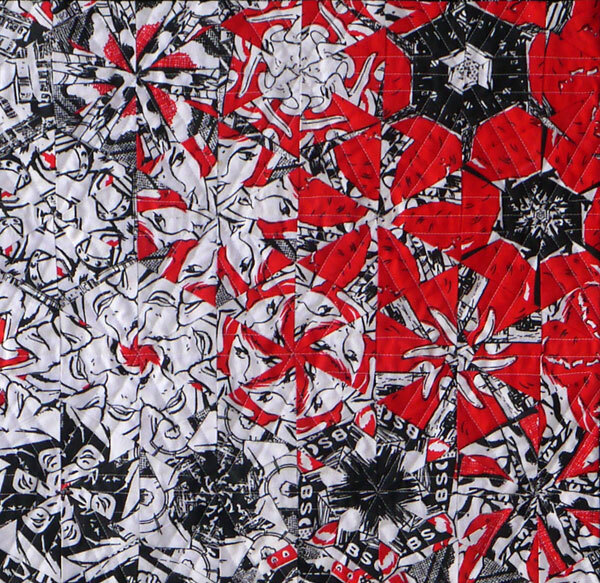 It was quite hard to come up with a quilting design for the centre area of hexagons composed of triangles. I played with circles, but it was difficult to be accurate and then it started to look a mess. 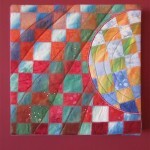 So I went with straight line quilting in the end. So it seemed to be the natural conclusion to continue with lines onto the borders, but boy was that a lot of sewing that had to be done. Here is a detail of the centre panel, which is a one-block wonder section using some fabric I bought a good few years ago in Amsterdam that is a print like a comic book. I like the fact that the centre panel fits well to my philosophy that a quilt should allow the viewer to find details to surprise and delight on closer inspection. It’s only close up that you start to see parts of the face of the girl in the comic print. So on my next visit all I have left to do is attach a hanging sleeve and Black and White #2 can be hung up over the second guest bed. In my old studio I had a moderation board on castors that I used as a design wall. Apart from the fact that the castors got mounted incorrectly, so that the brakes were both on the same side of the board and it never could be made to stay in one place of its own accord, it served me well. It came with us to Spain, but unfortunately it was damaged in the move. At the time we didn’t give it much thought, but got rid of it. It took up a lot of space in the room and so it went. We didn’t really consider what would replace it. Ideas came and went, but the design wall did not materialise. It’s more like a design curtain than a design wall and I had to pin the piece to the cloth as it didn’t want to stick, but it’s a definite improvement. This week a number of things happened. 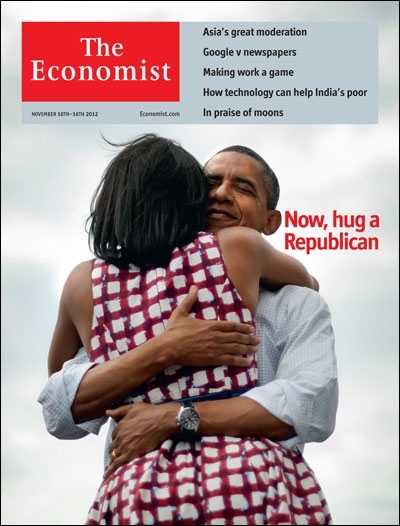 On 6th November Barack Obama was re-elected as President of the United States. On 8th November my used copy of The Uncommon Quilter by Jeanne Wiliamson arrived in the post. Two seemingly unrelated events. There is a connection though. I have been looking for something to keep me creatively occupied here in my flat in Kronberg and bought the book hoping for some inspiration. 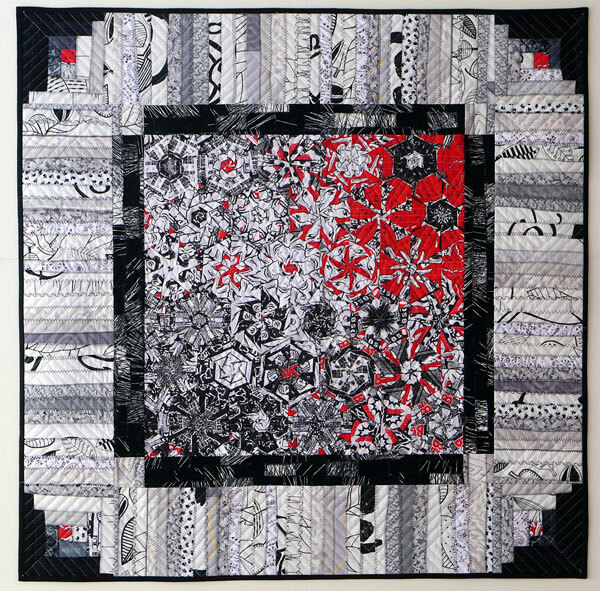 I had decided that if I can’t sew quilts here, then maybe I could create some journal quilts from paper and other things I have access to here. 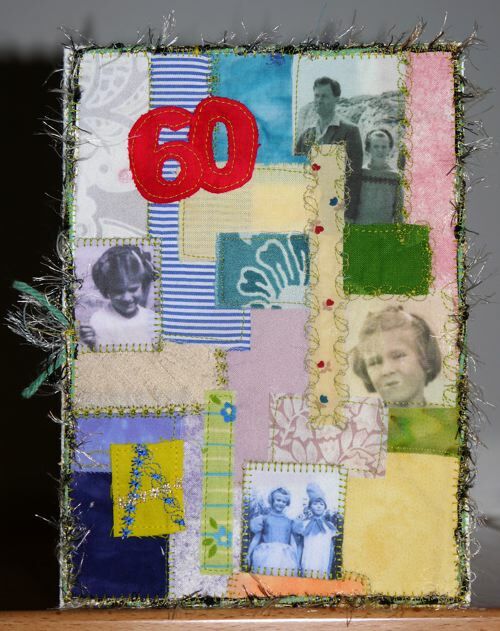 As the “mother” of journal quilts I hoped her book would give me some ideas. 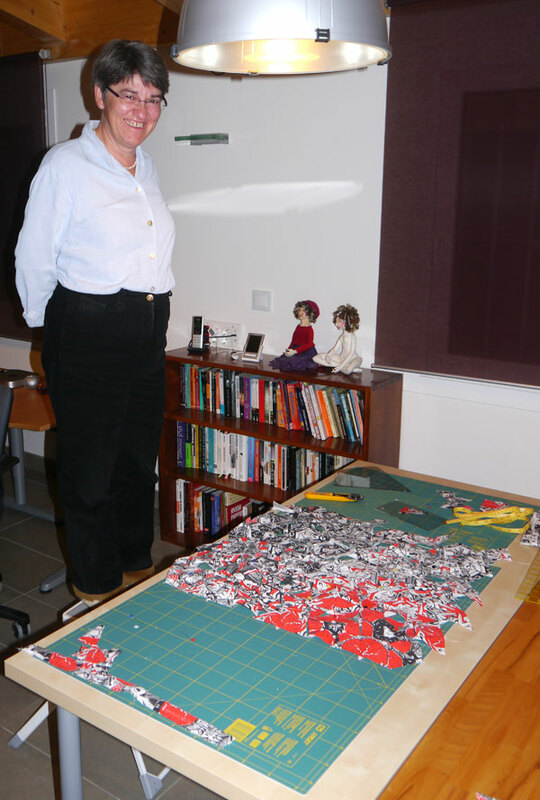 I’ve also started a collection of papers and other bits and pieces that I think may have a use some time in one of my quilts. Let’s see where this idea takes me. As for the book, I think I would have been a little disappointed if I had paid the full price for it. 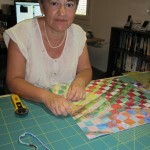 Most of the book is taken up with step-by-step illustrated instructions on how to make the same journal quilts as Jeanne herself made. I don’t really feel that journal quilts are the type of quilt that someone else really wants to make again for themselves. Having said that, there are enough ideas in the book that I think it was worth buying second hand. That amount of money was well invested. P.S. My sister is not called Florence, but at some point in our lives we started calling each other Florence. No-one else does. It’s just one of those traditions that bind families or in this case sisters together. I’ve no idea now how it got started. I’ve just watched this video of Neil Gaiman addressing the University of the Arts (Philadelphia) Class of 2012. It was interesting enough to want to share it with the rest of you. P.S. Watch out for some of the altered mortarboards in the video. 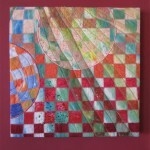 We have had time in the last few weeks to start finding homes on our walls for quilts and other pieces of art. I thought I’d share a few photos of them here. 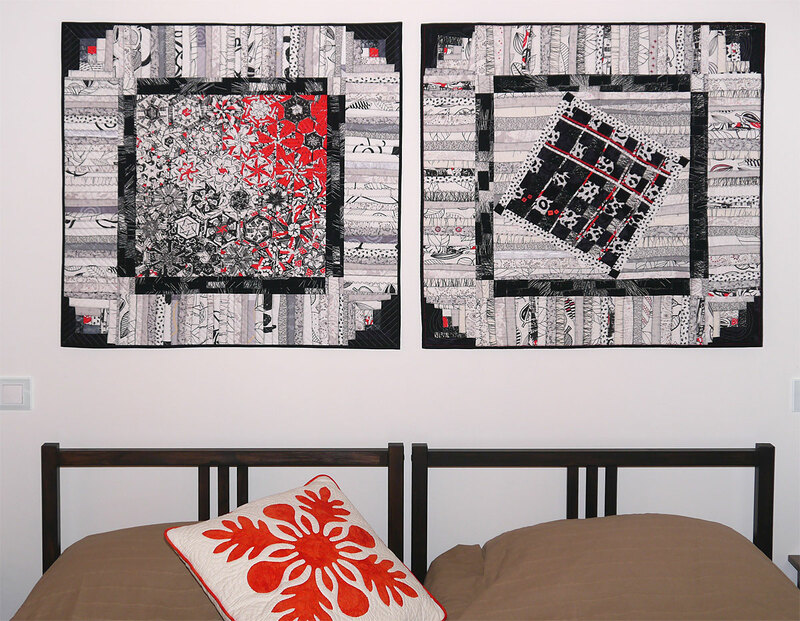 I found it interesting that despite being able to choose again, which of my quilts to hang on the walls, I didn’t decide to hang any of my newer quilts. 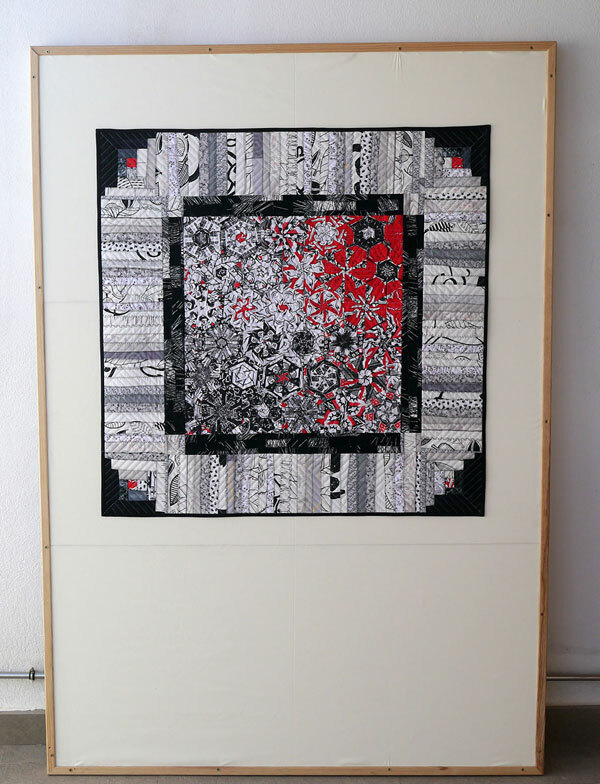 Although I enjoyed doing my City & Guilds course and learnt quite a lot doing it, during the course I didn’t produce any quilts that I really want to see hanging on my walls and be continually looking at. 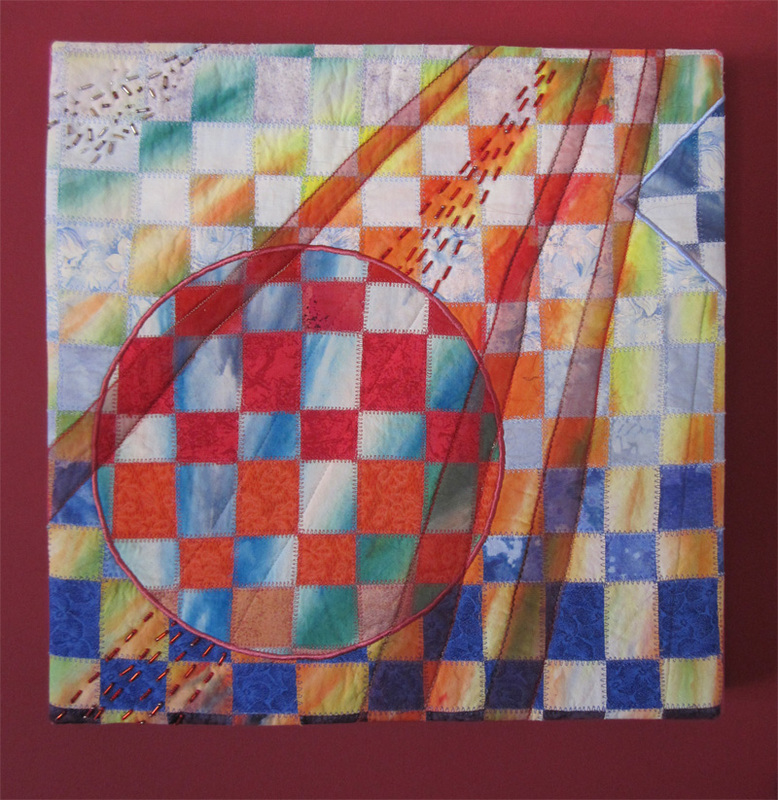 Even quilts that have been in exhibitions like my Colour Vortex quilt, when it came down to hard choices, did not get a space on the wall. I suppose the moral of the story is that the quilts I made to fit someone else’s constraints are not the ones that really express what I want to be creating. 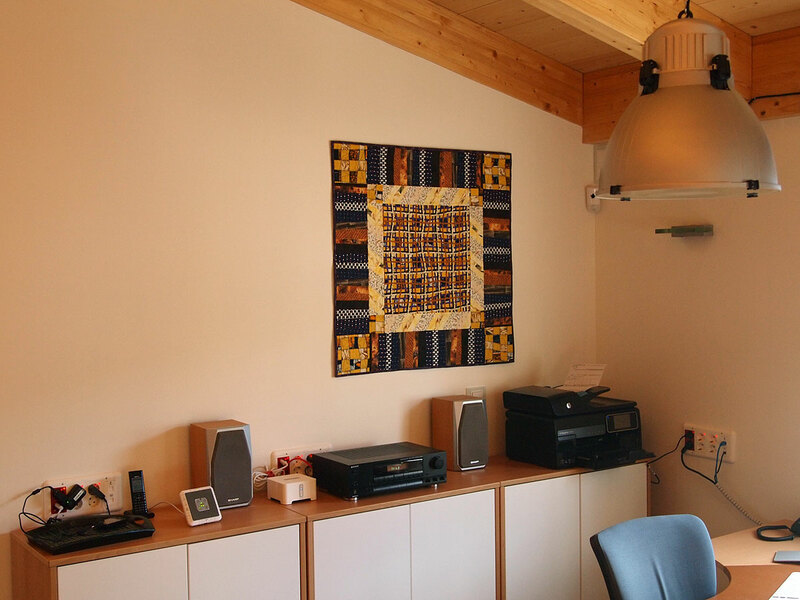 One of my old favourites that never made it onto the wall in our last house, Compass Rose, is now hung on the studio wall behind my sewing table. I’m pleased that it has finally come out of wrappers. Detachment comes with the passing of time and I was able to be more objective about other quilts, so Farbenfroh did not pass muster and has not been hung. It was an interesting experiment and I like the idea behind it, but at the end on the day the actual execution did not make the grade. So far we only have one other picture on the wall and 3 family photographs. When you don’t have so much wall space it is hard to decide what pictures should get hung again. 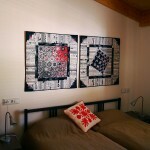 DH and I agreed easily enough as to which quilts to hang. 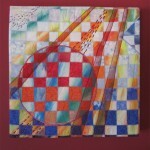 The other art works are going to take more negotiation before we are agreed. 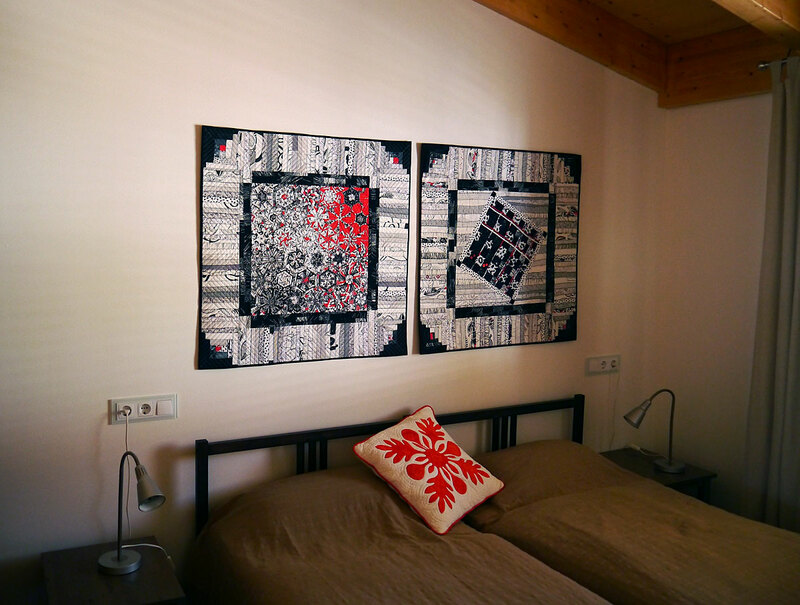 And of course there is some space left on the walls, where some new quilts will find a home once they leave my imagination and become real. 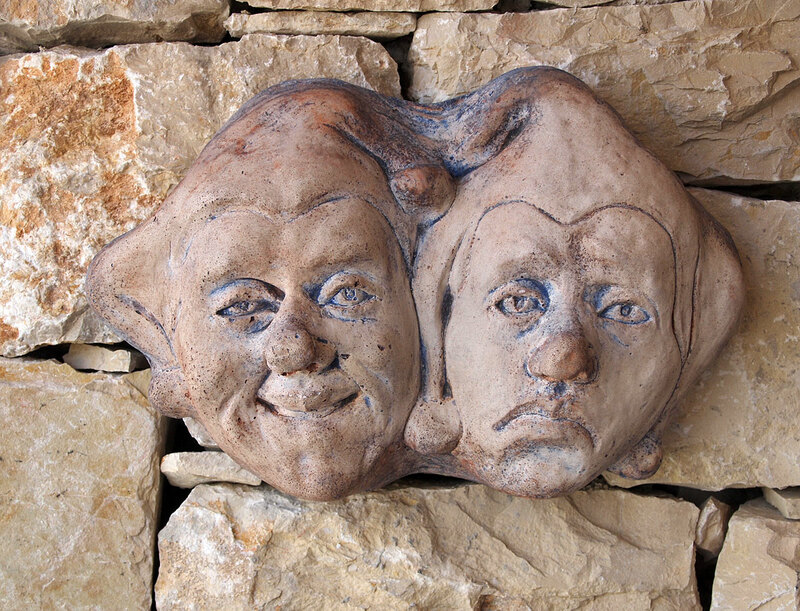 I had to include a photo of the Jesters. I love these faces. 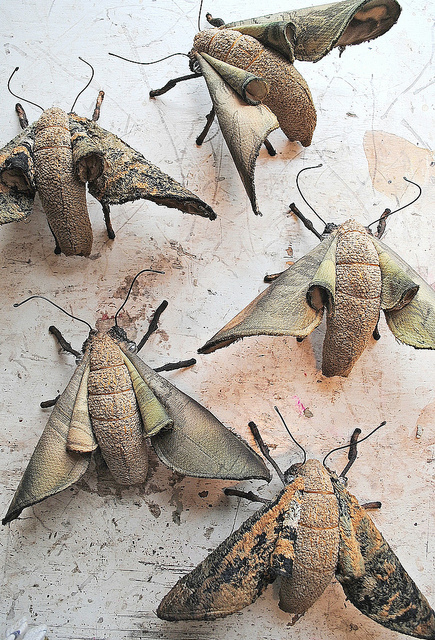 We bought them in Devon years ago now. 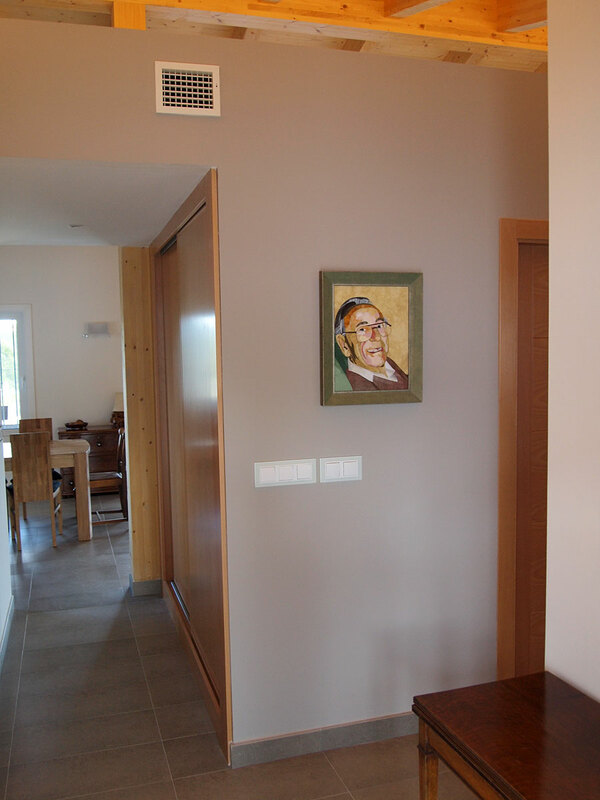 We were worried about the weight of them on plasterboard walls so they are hung in the outside seating area on the terrace, where they blend nicely with the stone walls and delight you when you notice them. 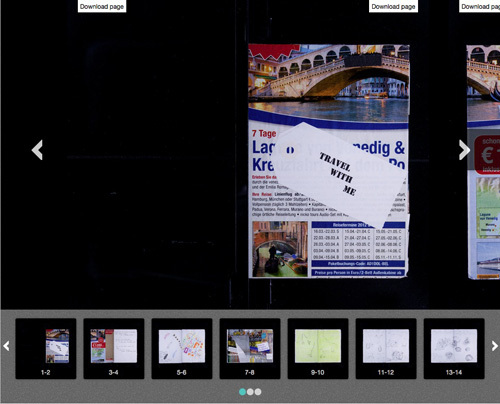 My contribution to The Sketchbook Project: 2012 has been added to the first draft of the Digital Library. You can take a look at it here. They have done a good job of the scanning, apart from the one page where there are fold-outs that have been scanned in the folded up position, which looks rather strange. I think it’s a pity that the Art House Co-op seems to insist that you register with them to be able to view the sketchbooks, but I hope that people won’t be put off by that. 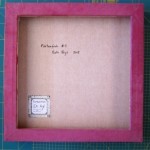 It is certainly interesting to look at the other sketchbooks available. I’ve been taking a look at how others have interpreted my chosen theme of Travel with Me.